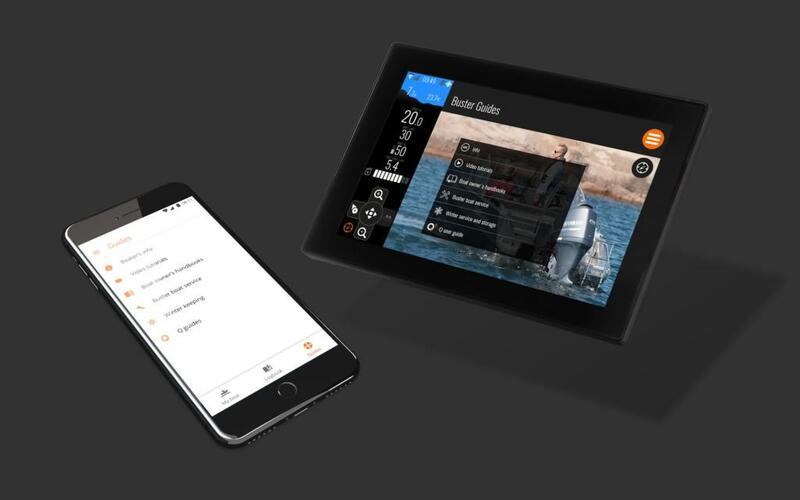 Finnish powerboats manufacturer Buster Boats is launching the first ever mobile application based on the Q system. Application’s purpose is to extend Q system’s benefits by allowing boat owners to use some key functions, not only on their boat, but where ever they are. Remotely monitor boat’s status, e.g. fuel level, battery voltage and location. When synchronized with Q Panel, the app automatically stores each trip on the logbook. App’s logbook works as a backup for your information and it’s also possible to share best trips with family and friends. A comprehensive library of Buster’s boating guides and videos. Easily renewing and managing the Q Panel’s data plan. A useful application for remotely monitoring boat’s status would be e.g. checking that boat’s battery is ok before leaving home. You might also want to check boat’s location if you have borrowed it to a friend and want to make sure they returned it in the right place. Avoiding inconvenient surprises is now easier than ever. Application’s automated logbook is designed to make the boating experience smoother, too. In the Q system a trip is a concept for a way traveled from starting your boat to shutting down the engine. With user’s authorization, Buster app can synchronize all trips to the server. They can be used as a backup in case anything happens to the actual Q Panel. Trips and routes can also be shared with others through the app. If you don’t want the app to save all your trips, synchronization can always be turned off on Q Panel’s Settings. Buster app lets you view and share the trips traveled on your boat. Buster app also contains the same boating guides and manuals that can already be found on the Q Panel. Only now, thanks to requests from users, you don’t have to sit by the panel to read and watch them. Instead, you can browse them on your phone where ever you go. App has a library of Buster guides just like the Q Panel. App’s fourth main functionality is managing the Q system’s data plan. Boat manufacturers can provide Q system’s users with a free subscription for a specific time, but when this subscription runs out, boat owner must renew it. For Buster Boats the new app offers an easy way to purchase and manage the Internet subscription. “Q Experience is an open and flexible system and we are happy to complete boat manufacturers’ requests for extensions like this. Buster app is the first of its kind but I can definitely see that other manufacturers, too, could want this kind of app in the future.” comments Q Experience’s CTO Johan Wessberg. You’ll find instructions on how to link Q Panel to the mobile app on Q Experience’s YouTube channel. In order for this feature to work, please make sure that you have updated your Q Panel software to the version .277 or newer. Q Panel will automatically suggest an update to the newest software when you turn on the system. Buster’s app is currently available in Play Store for Android and on App Store for iPhone.